Recently I was clearing through a box of old stuff, and I found a copy of ".Net - The Internet Magazine" from March 1995. Seeing the magazine again reminded when I bought it - I was in my third year at University, and the only practical way I had to get onto the net was to use the Sun Sparcstations in the university lab. From what I remember of the internet in 1995, most of it was about Monty Python or Star Trek. 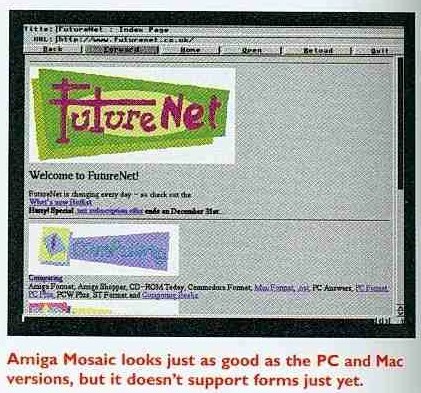 What I found in the old magazine pretty much supported that memory. 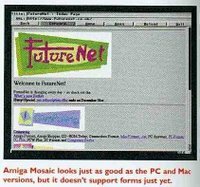 An article with the headline "Microsoft's on-line plan still waiting - The Microsoft Network is raring to go, but Windows 95 is delayed, yet again.". The article explains that Microsoft expects their on-line commercial services such as MSN to become 'as popular as TV'. 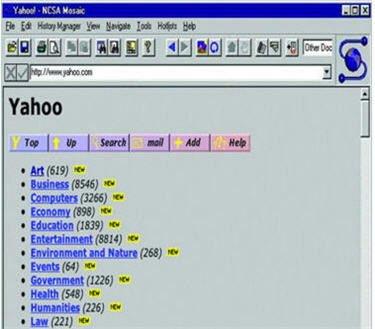 MSN is planned to be an AOL-type network with proprietary content not available on the main internet. Meanwhile, the shipping date for Windows 95 has been put back for a third time, to August 1995. 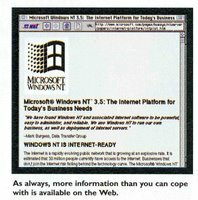 Another article with headline: "Windows NT: the easy option", explains that Windows NT 3.5 comes complete with FTP, gopher and Web server software. 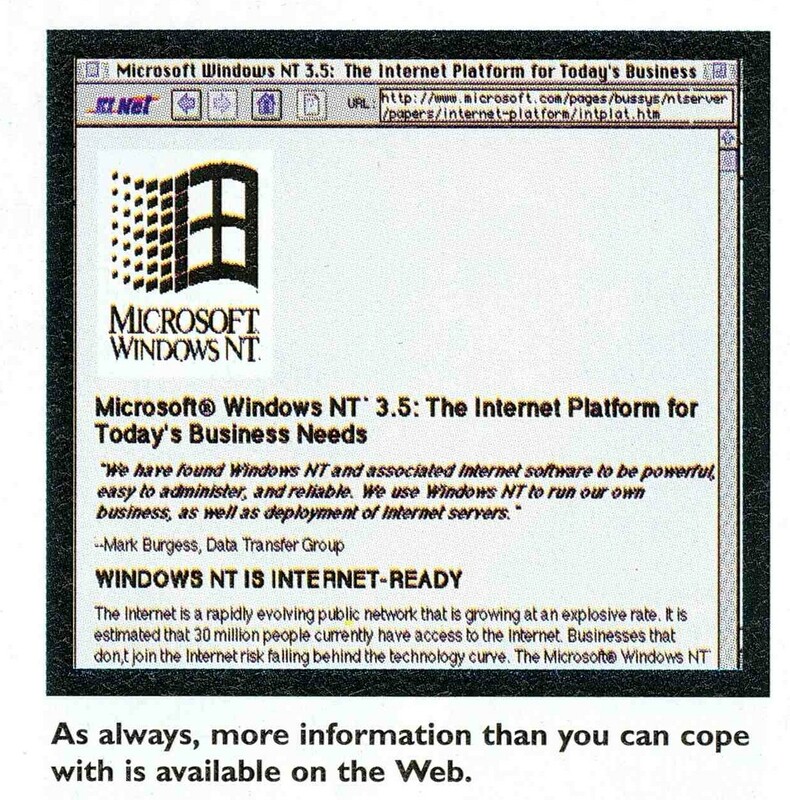 However IIS wasn't around yet (it first appeared as an add-on for NT 3.51, a few months later). The internet server software for NT 3.5 was freeware that had been developed by the European Microsoft Windows NT Academic Centre for universities and colleges that run Windows NT servers. 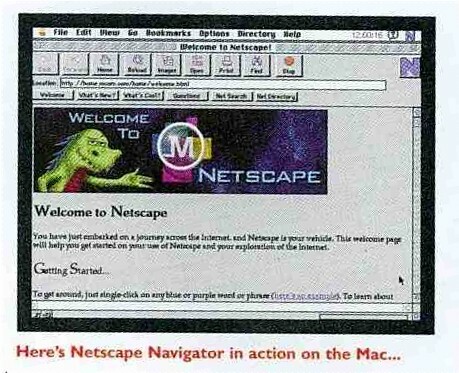 On the cover the magazine estimated that 23.5 million people were 'netsurfing' daily in March 1995. Although inside the magazine, William Poel points out that "The last time I looked, combined sales of Internet magazines in the UK were running at about 5 times the number of actual dial-up accounts". So in 1995 people seemed to be spending more time reading about the internet than actually getting on to it. In January 2008, the estimate of the number of people regularly online was 357.9 million, although they no longer call the metric 'people netsurfing daily', they call it the 'Active Digital Media Universe'. "Most of the "making the internet easier to use" announcements we see are for front-end software programs, which are much easier to produce than the intelligent searching agents we all really need. In the meantime, searching the internet remains slightly less difficult than decoding a restaurant menu in a foreign language - with the best way to surf being to visit Home Pages and hotlists that other people have gone to the trouble of setting up, such as the justifiably popular Yahoo at http://akebono.stanford.edu/yahoo/." 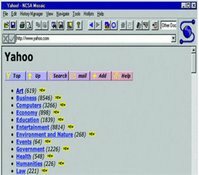 At that time, Yahoo was a large collection of categorised links - it was already very popular and would start its transformation into a major web portal in the following years. The research project that led to Google would not begin until January 1996, and would initially also have a Stanford URL: google.stanford.edu. The domain google.com was eventually registered on 15th September 1997. 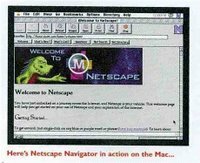 The magazine had a go at reviewing the popular browsers of the day, but this was a largely academic exercise, as Netscape Navigator 1.0 had been released a few months earlier and was way ahead of everything else. "... the songs themselves are available as stereo MPEG audio files, but file size runs at a whopping 1Mb per minute, so a four minute tune would take approximately a zillion years to download from the UK." "IUMA subscribes to the growing view, that CDs will soon be compiled at home, with the music downloaded through fibre-optic cables to recordable CD-ROMs. 'This will represent the future of music distribution,' agrees Michael Stone, an LA lawyer who has provided free legal advice for IUMA. 'Once fibre-optic cables are hooked up to every home, you can kiss the record and video stores goodbye.'" Pretty prophetic ... well, except for failing to predict the rise of MP3 players, the fact that broadband speeds can be achieved without fibre-optics, and that people do still kindof like buying CDs and going to record shops. Finally, there was an interview with Ricky Adar, who in March 1995 was preparing to launch his Cerberus Digital Jukebox system. Cerberus was basically iTunes Store - an integrated online music purchasing, downloading and playing system with built in DRM (except they didn't call it DRM back then). But this was 8 years before iTunes Store would be launched - Cerberus had done a lot of bleeding edge work: audio compression, DRM, online payment and negotiating deals with record labels and the Performing Rights Society. As you've probably never heard of Cerberus, you can guess that this commendable cutting-edge initiative never really took off. They did launch, and became the first company in the world to distribute music over the Internet legally. But they were too far ahead of their time - people were not ready to play music through their PCs then, and MP3 players were years from becoming commonplace. In an interview in Sound on Sound magazine in Feb 1999, Ricky said: "The truth of the matter is that we haven't had that many downloads. There is a market on the web -- but we don't think it's a market that's going to mature as fast as we'd like". Around that time Cerberus also experimented with Virtual Record Store machines in shops and cyber-cafes. Customers could choose the tracks they wanted, pay the machine, and get a CD-R burnt for them. They were in Levis stores for a bit, but it didn't take off. Reading about Ricky Adar left me wondering what he was doing now, after such a promising startup failed to start-up. Googling him didn't turn up anything recent, so I imagined him being eternally grumpy somewhere and spending his time smashing up iPods with a hammer, having given up on the software industry. But then I found this blog post, and it turns out Ricky Adar was a pseudonym, and Richard Faria is now CEO of tenomichi.com, purveyors of some very complex looking 3D tools. As he says in a comment on the blog post, "Lets hope I'm not ten years too early again! ".